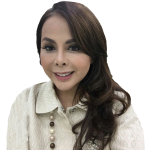 Serving as senior advisor to BGA for nearly a decade, Fetty Azizah has 20 years of experience in business advisory services, public and community relations, and corporate crisis management and risk mitigation in Indonesia. Fetty’s business-advisory focus and sector expertise is in financial services, energy, infrastructure, and defense sectors. She brings with her an extensive network, encompassing the highest levels of Indonesia’s state-owned enterprises, corporate and financial circles, the executive and legislative branches of government (both local and national), political parties, as well as journalists, NGO activists, analysts and think tanks. Her experience in engaging top decision makers and influential stakeholders, has made Fetty an industry leader in both shaping Indonesia’s public opinion and gathering business intelligence. In addition to her long-term senior role in BGA, Fetty is founder and CEO of MediaComm, an investor relations and corporate communications consulting firm in Jakarta. Prior to establishing MediaComm, Fetty was previously in charge of the special supplements section of the Wall Street Journal and for the International Financial Review (IFR) in London. Fetty also served as senior director for BrooksBowerAsia from 2004 to 2006. Fetty earned her bachelor’s degree from the University of Indonesia and is a graduate of the School of Journalism at the University of California, Berkeley.